We'd love to help with your wear challenges! Quality control starts from the molten iron. 2. Engineers with 30 years' experiences in casting and brazing. 3. Tracking number on each wear block, quality is our culture. 4. VCI bag for packing, Volatile Corrosion Inhibitor bag to fight against the corrosion. 1. We accept sample order for quality testing. 2. Sample cost required(will be deducted in your future order) and the freight collect. The unit price will be 10~20% higher than the bulk price. 3. For regular customers, samples are free. 4. 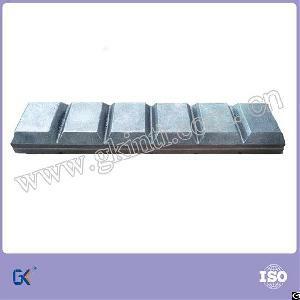 Sample lead time: 5~10 working days after sample cost received. 5. 1~2pcs sample for quality checking. Just need the shipping charge. Company Name: Gk International Enterprises Co., Ltd.